Deep-sea fish oil (from anchovy, sardine and mackerel), bovine gelatin, vegetable glycerin, natural orange flavor, rosemary extract, natural non-GMO mixed tocopherols (antioxidant). Platinum highest supercritical 1005 mg EPA/DHA + extra vitamin D.
Increase your Omega-3 to adviced to healthy value as 8-11%. 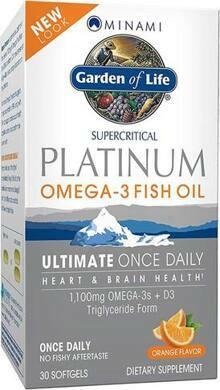 One Platinum softgel provides an amazing high amount as 1100 mg Omega-3 with 765 mg EPA and 240 mg DHA and extra vitamin D per 1 softgel. Omega-3's for maintaining a healthy blood circulation, while the EPA content is kept high in order to boost your emotional wellbeing. High EPA fish oil supports mood and helps maintain clear arteries, as physical wellbeing, all enormous advantages to keep your Omega-3 levels above the healthy advised 8% in your body. Other ingredients: Supercritical deep-sea fish oil (anchovy,s ardine, mackerel, herring), gelatin, glycerin, purified water, natural orange flavor, soy lecithin, mixed tocopherols.